This red blood cell is swollen by the malaria parasite. 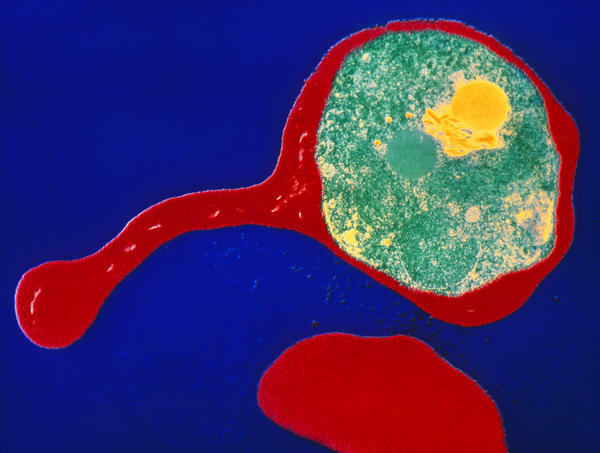 In this image from a transmission electron micrograph, the blood cell has been colored red and the single-cell malaria parasite has been colored green. The device works by shining a laser light through a drop of blood, measuring how much light is transmitted, and then holding the magnet close to the blood sample and taking another measurement. "Healthy blood is non-magnetic," explains Andrea Armani, Irani Professor of Engineering and Materials Science at the University of Southern California. "So if you take a healthy blood sample, you put a magnet next to it, your signal isn't going to change. "In contrast, if you have a sample of blood that is infected with the malaria parasite, and you put a magnet next to it, the amount of light that can go through that sample will change," Armani says. That's because the magnetic crystals are pulled out of the beam of light by the magnet. A full description of the device appears in the journal ACS Sensors. Armani has been working on new medical diagnostic tools for some time, but she had never had a particular interest in malaria. That changed a few years ago. She was in Geneva, where she heard a talk from officials at the World Health Organization. These officials said efforts to bring malaria under control would be helped enormously by better rapid detection tests. After the talk, Armani had an epiphany of sorts. "I lead a research group with a lot of really smart students," Armani recalls thinking. "If I directed all their energy in a concerted effort, we could actually change the world." So that's what she decided to do. Her graduate student Samantha McBirney was also interested in changing the world. "I've never really envisioned myself being the type of engineer who works on developing the iPhone 23 or works on creating new face filters for Snapchat," McBirney says. So McBirney and Armani started working on a detector. McBirney says they had one overarching goal for their device: "Keeping it as stripped and inexpensive and as easy to use as possible." The device is basically a box about the size of a toaster-oven. Inside is a laser, a magnet and a detector. It's not a fancy laser. "It has about the same amount of power as a laser pointer," Armani says. Nor is it a special magnet. "It's about the same strength as a refrigerator magnet," she says. "And it costs just as much." All you do is put a small amount of blood in a clear tube and drop the tube into the box. The device measures the amount of light transmitted through the sample with and without the magnet present. If there are parasites present, the light transmitted through the tube will increase because the magnetic crystals are pulled out of the light beam. Armani and her colleagues design the box to be rugged. It's been shipped to various places around the country without mishap. Others are working on new types of rapid screening tests. Hemex Health has a testing device that is also based on the magnetic crystals produced by the malaria parasite. A company called Masimo has received money from the National Institutes of Health to develop a malaria detection device that works through the skin, so there's no need to take a blood sample. Armani's device hasn't found a commercial partner. Since she and her colleagues designed the device to be as low-cost as possible, it's not particularly appealing to investors since there's no obvious profit model. But Armani intends to keep plugging away on her device ... doing whatever is needed to test it in human patients and show that it will be a valuable tool. That's what you have to do if you want to change the world. Each year, malaria kills about half a million people around the world. Health officials say a fast, cheap, accurate way to test for malarial infection would be extremely helpful in combating the disease. As NPR science correspondent Joe Palca reports, some engineers in California say they have invented a device they hope will do just that. JOE PALCA, BYLINE: A few years ago, Andrea Armani heard a lecture from officials at the World Health Organization about the need for better tools for detecting the malaria parasite in people's blood. Armani is a professor of engineering and material science at the University of Southern California. She says the lecture resulted in a kind of epiphany. ANDREA ARMANI: I lead a research group with a lot of really smart students. And if I directed all their energy in a concerted effort, we could actually change the world. PALCA: So that's what she decided to do. Even though she had no experience with malaria, she decided to build a parasite detector. Her graduate student Samantha McBirney was completely on board with a project aimed at changing the world. SAMANTHA MCBIRNEY: I've never really envisioned myself being the type of engineer who works on developing the iPhone 23 or works on creating new face filters for Snapchat. PALCA: So McBirney and Armani started working on their detector. McBirney says they had one overarching goal for their device. MCBIRNEY: Keeping it as stripped and inexpensive and easy to use as possible. PALCA: The device is basically a box about the size of a toaster oven. Inside are a laser and a magnet. Andrea Armani says it's not a fancy laser. ARMANI: It has about the same amount of power as a laser pointer. PALCA: The magnet is small and cheap, too. But the magnet is key because it turns out that the malaria parasite produces tiny magnetic crystals inside the red blood cells it infects. Normal red blood cells don't have these crystals. So Armani says if you shine a laser light through a sample of uninfected blood and then put a magnet next to the sample, nothing happens. ARMANI: In contrast, if you have a sample of blood that is infected with the malaria parasite and you put a magnet next to it, the amount of light that can go through that sample will change. PALCA: The magnet pulls the crystals out of the way so more light can shine through. That change tells you whether the parasite is present. She says the device should be able to detect infections even before someone is showing symptoms. A description of the invention appears in the journal ACS Sensors. There is still a lot of work to be done. Armani is testing her device on animals infected with malaria. Then she'll try it out on infected people. That will take a while. But if you want to change the world, you have to start somewhere. Joe Palca, NPR News. (SOUNDBITE OF FRANK OCEAN SONG, "LOST") Transcript provided by NPR, Copyright NPR.